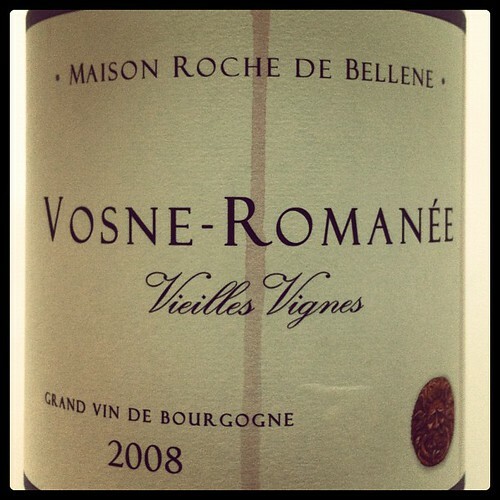 maison roche de bellene | Joy. Journey. Jotter. Beautiful deep, violet cherry core; slight reduction, tart berries, Asian spices, oak and baked cherry tart nose ; tart cherries, vanilla cream, sweet cinnamon on the palate; smooth, velvety tannins, very good acidity, medium plus finish. Needs time for the oak flavours to integrate further but seriously, this is one hell of an easy wine to drink in its youth, especially with some greasy, artery clogging American style pizza (that’s what I had on a dull Wednesday night)! 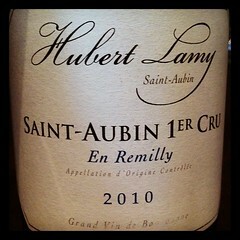 I was addicted hooked the day I was introduced to Lamy’s fresh, vibrant (almost nervous) and delicious whites a few years ago. Those who have not tasted the wines will usually brush them off as a not-so-famous therefore equally not-as-good appellation. And this trend seems to be quite prevalent in the Chinese market where these wines are sold at ridiculously cheap prices. My dear friend AAK threw in a few other burgs for the tasting as well and if you don’t see any notes or pictures (for them) here, it can only mean I was too busy drinking the wines instead of typing vigorously on me phone. Cream, vanilla, vibrant ripe lemon, lemon peel and a little smokiness; intense lime and oak flavours which are already well integrated at such an early age; medium-plus to high acid; medium-plus to long finish. Yummy! 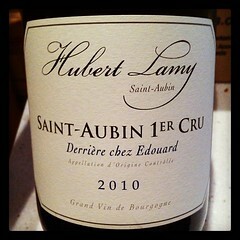 The trio of Saint-Aubin by Lamy was somewhat challenging on the tastebuds. I am not quite sure if I could tell them apart in a serious blind tasting and perhaps after a few years in bottle, their differences will be more apparent. I’m actually happy to report that the Clos de la Chateniere 2010 is really good, and I am glad I made a prudent decision on its pre-arrival offer. But you know what? The En Remilly and Derriere chez Edouard are also very moreish, especially with morsels of chevre on Maison Kayser‘s baguette. White flowers, nectarines, chantilly cream; lime cordial, soursop, tart lemon; medium to medium-plus acid; medium length finish. The lightest of all the St.-Aubin. 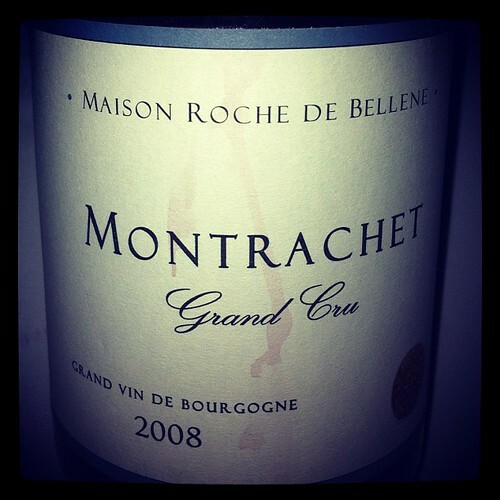 Floral, limes, flint; rich, mineral notes, stones, oak and cream; medium-plus acid and finish. Flinty, intense lime peel, vanilla pods, cream; intense lemon, oak, vibrant, juicy, tight, almost unyielding; medium-plus acid; long finish. Floral, perfumed, white flowers, a little tight, reductive; similar flavours on the palate with some nuances of light honey and field blossoms; elegant, tasty and slightly phenolic towards the end; medium-plus acid and length. Perfumed, red cherries, jasmine tea leaves, a little earthy; ripe cherries, spicy, floral, elegant, light liquorice, slight tannic grip; medium to medium-plus acid and finish. Clean, flinty, fresh lemon peel, cream; fresh lime, tart lemon, vanilla and slightly bitter notes; medium-plus acid; medium-plus to long finish. (I brought this bottle). Clean, fresh, flinty, oak, vanilla, ripe lemons; intense oak and lemon flavours, smooth, tasty, slightly honeyed; medium to medium-plus acid; medium-plus finish. (Guessed the appellation correctly but got the year wrong – thought it was 2007). Muted, wet stones, oyster shells; strong oak and bitter lemon; medium to medium-plus acid; medium finish. 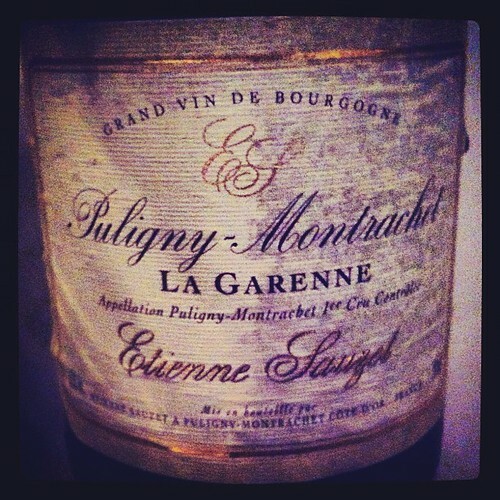 White floral aromas appeared later as the wine warmed up in the glass. (I thought this was a chablis on first sniff but the white floral aromas and the strong flavours sent a different message. I thought the wine had seen some age on it and may have been a pre-2000 bottle. We were surprised when the answer was revealed. Time to drink up I guess!). 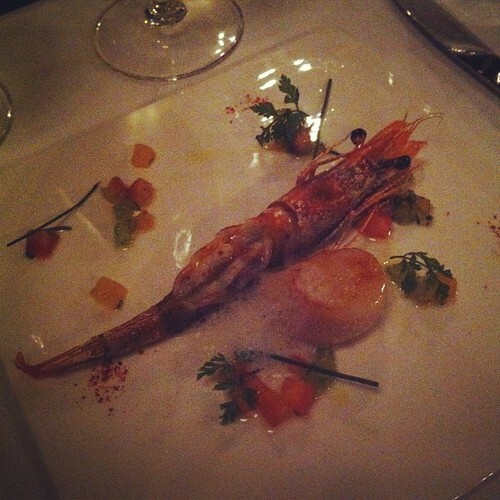 And here’s the starter that accompanied all the white burgs. 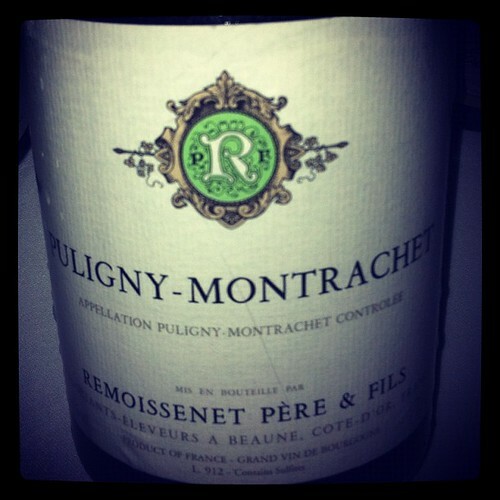 For me the Montrachet did the job beautifully with the obsiblue prawns and the Remoissenet’s P-M was a better match with the scallops. 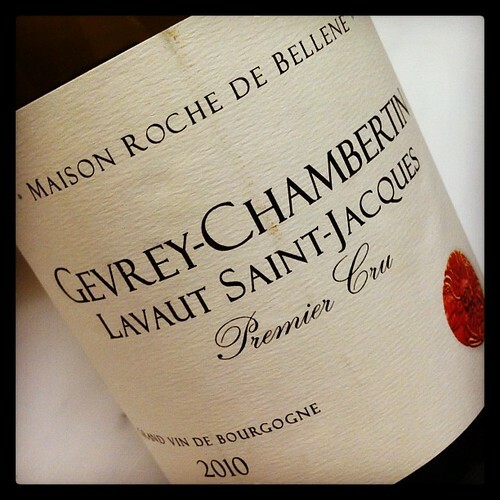 A simple, pleasing, and down-to-earth village burgundy with nuances of spice, tart cranberries/strawberries and a slight grippy finish (providing texture). And it was also inexpensive (as it should be). Not for the long haul.